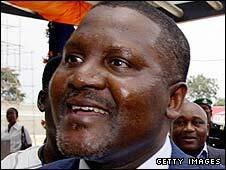 Nigerian businessman Aliko Dangote has denied planning a move to buy a 15.9% stake in Premier League side Arsenal. Reports claimed he was interested in Lady Nina Bracewell-Smith's shares, which are available for about £100m. In a statement, Dangote confirmed he had "been involved in conversations around investment in the past". But he added: "I can say categorically at this time that I have no intention of investing in the club and will not be acquiring a stake." Dangote, group president and chief executive officer of the Dangote Group, is reputed to be Africa's richest man, with Forbes magazine in the United States estimating his fortune two years ago at $3.3bn (£2.3bn). His wealth was built on a business empire that he founded in 1977 and now includes the number one sugar production company in Nigeria, a cement factory and textile products, plus he was made a Commander of the Order of the Niger five years ago. He recently told Nigerian newspaper ThisDay that he had been an Arsenal supporter for a "long time" and stated: "It started in 1980 when I forged a relationship with Mr David Dein, former vice-chairman of the board of Arsenal." Last month, Lady Bracewell-Smith instructed UK brokers Blackstone to find a buyer, having previously given up her place on the club's board in 2008. Stan Kroenke and Alisher Usmanov are Arsenal's two largest shareholders and it was thought that her decision to sell might lead to a bidding war between them. US billionaire Kroenke owns 29.98% of the club's shares, while Russian tycoon Usmanov holds 26.29%, but if any shareholder's stake reaches 30%, he or she is obliged to make a takeover offer for the club. Neither Kroenke - who also owns the NBA's Denver Nuggets basketball franchise, Major League Soccer's Colorado Rapids football club and a stake in the NFL's St Louis Rams American football team - nor Usmanov has so far been willing to take that step. And Blackstone, who have been advising Lady Bracewell-Smith for several months, have been looking for an appropriate alternative buyer. Dangote has ruled himself out but his statement read: "I wish Arsenal Football Club the best for the future and will continue to follow the team as a fan." According to the Daily Telegraph, Blackstone has also spoken to consortiums in Eastern Europe and the Far East but the Arsenal Supporters' Trust is urging Lady Bracewell-Smith to lower the asking price for her 9,893 shares.